Cuba's main resort, fun-filled Varadero occupies a narrow peninsula of white sand jutting out in to the warm waters of the ocean. The main town area offers numerous bars, shops and restaurants while hotels are dotted along the length of the glorious peninsula. 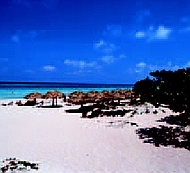 Nearby Jibacoa is a much smaller resort, located half way to Havana, and perfect for a relaxing, hotel-based holiday. Fun and sun are the order of the day here, with numerous water sports available on the beach and other activities such as swimming with dolphins and jungle tours by boat also available. Varadero also makes a great base for exploring the local area, and with Havana around two hours away and nearby Matanzas just down the road, there's plenty to do besides the glorious beaches! Most hotels in Varadero and Jibacoa operate on an All Inclusive basis, with most meals, drinks, snacks and activities included. Exact details vary from hotel to hotel, so check with us first. Hotel options in Jibacoa are more limited. Spend a week or two of pure relaxation in one of Varadero's or Jibacoa's great hotels, or combine either resort with other areas of Cuba. 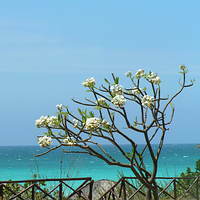 A few nights in Havana before your beach stay is straightforward and costs are similar - or less - to just a beach holiday. Alternatively, Varadero can be combined with one of our tours of Cuba, or with various Multi Centre or Self Drive itineraries in Western Cuba. 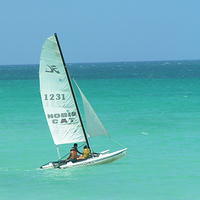 There are a number of flight options for getting to Varadero. Various charter airlines fly to Varadero airport (approx 30 minute transfer time), from around the UK, with most flight options being from Gatwick and Manchester. 7 or 14 night holidays are available. Alternatively, fly from Gatwick to Havana on various days with Cubana or Virgin Atlantic; or from various UK airports via Paris or Madrid. These flights offer flexible holidays including Multi Centre holidays, tours and self drive holidays in Cuba. Have a look at our great range of Varadero hotels for beach holidays, and our range of itineraries that feature Varadero plus other parts of Cuba. If you see something of interest call one of our friendly reservations staff on 020 8989 0970, or fill in a quote and we'll check availability and get back to you. If you're not sure what's best for you, ask to speak to one of our staff who've visited recently.